Welcome to our gallery highlighting the bespoke Xiaos house, a contemporary wood-filled home by PartiDesign. PartiDesign specializes in utilizing natural hued wood in spectacular, innovative ways. This meeting of traditional material with contemporary design creates a striking, Zen-like coherency for the entire space. Using subtly varied wood grains and hues, the designers have defined and differentiated the various components of the home. 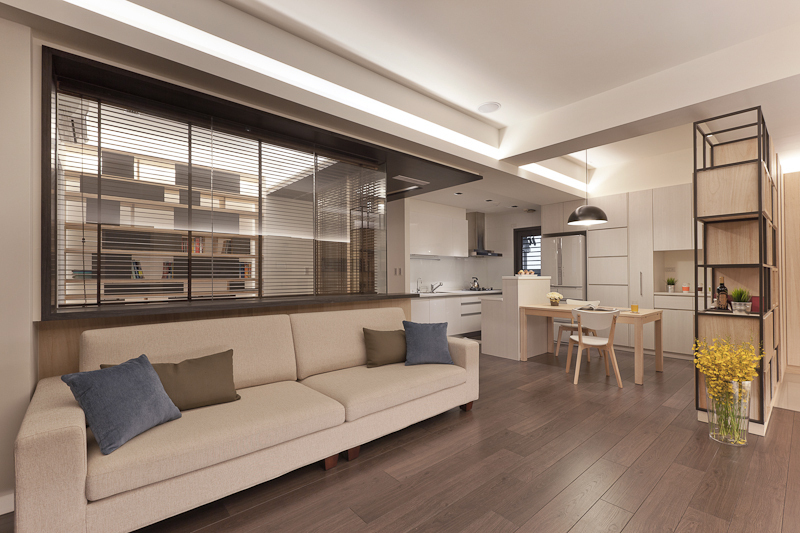 Subtle recessed lighting allows for an unfussy, sleek look. 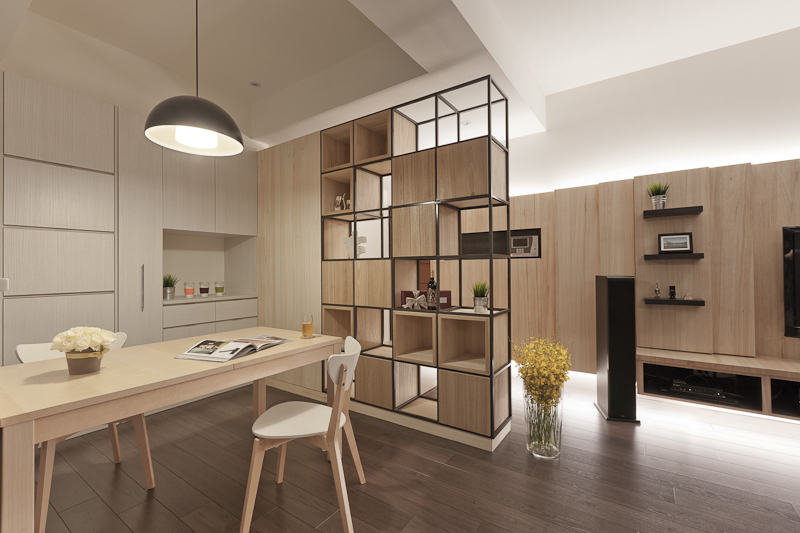 Throughout, innovative shelving and storage solutions organize and simplify the home. Standout features include a large central office, wrapped in glass that can be obscured via window shades for privacy, hardware-less cabinetry in the kitchen, and a wall-size display structure for the living room entertainment components. All furniture in the home fits within the neutral, natural hued framework of the design, including the lengthy sofa here below a set of wraparound windows defining a home office. Kitchen can be seen in background. 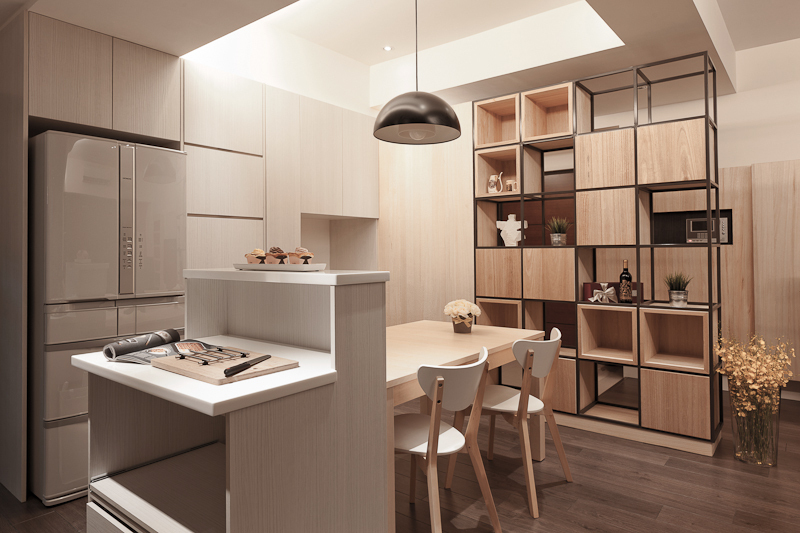 The kitchen is defined by a large cubical wall at right, with wood cubbies set in a metal framework. The two-tiered island is paired with a light wood dining table as the centerpiece, with off-white cabinetry surrounding. 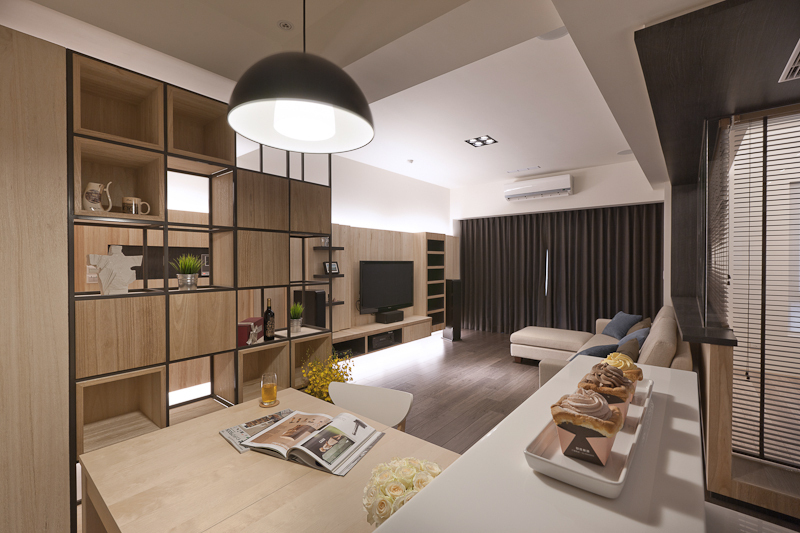 Turning to the side, we see how the relative wood tones define the spaces, with a richer wood employed in the living room as backing to the media area. A closer look at the kitchen reveals elegant dining chairs and sleek hardware-free cabinetry. 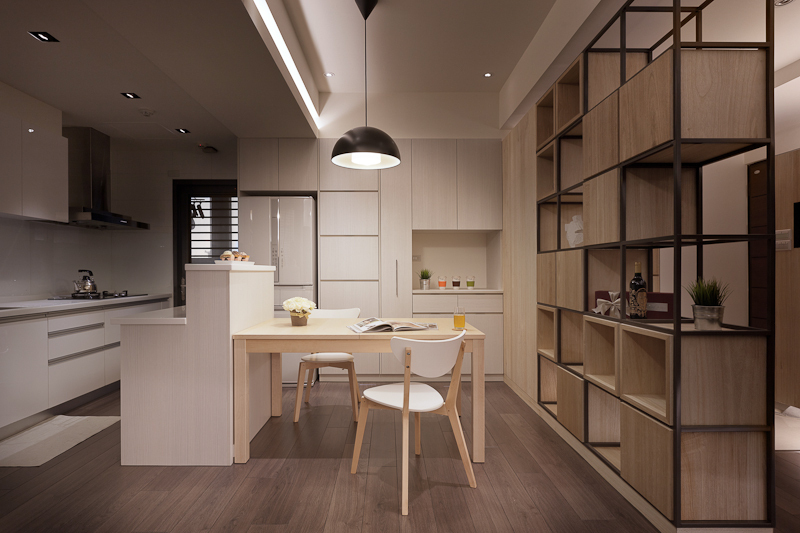 A single black pendant light hangs above. The kitchen island features a two-tiered design with ample storage space in a compact frame. Angled shot from the kitchen showing the expanse of open flooring toward the living room and balcony doors. 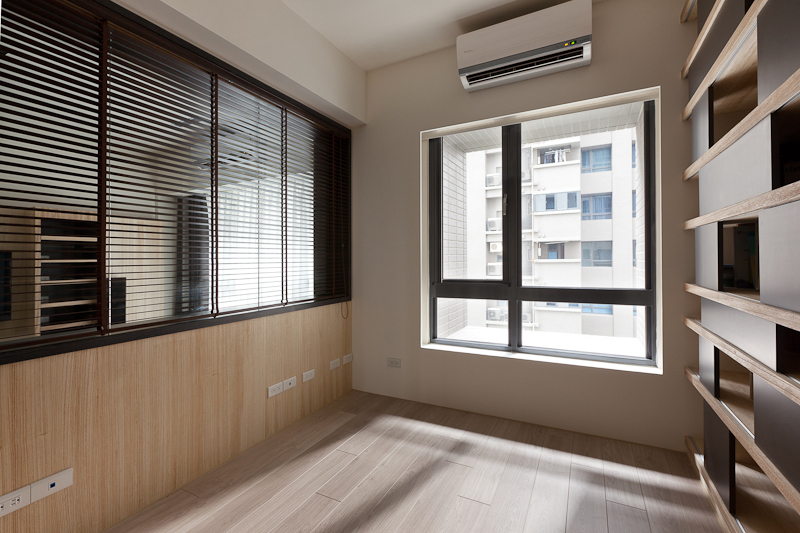 Moving inside the window-wrapped office room, we see a large exterior window and array of built-in shelving to the right. 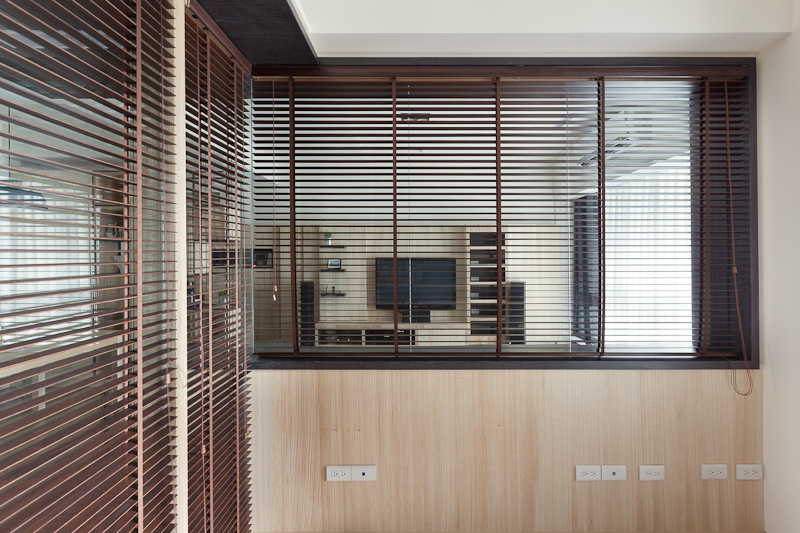 Brown hued shades grant the office space privacy. When opened, they allow the visual space to extend to the surrounding rooms. 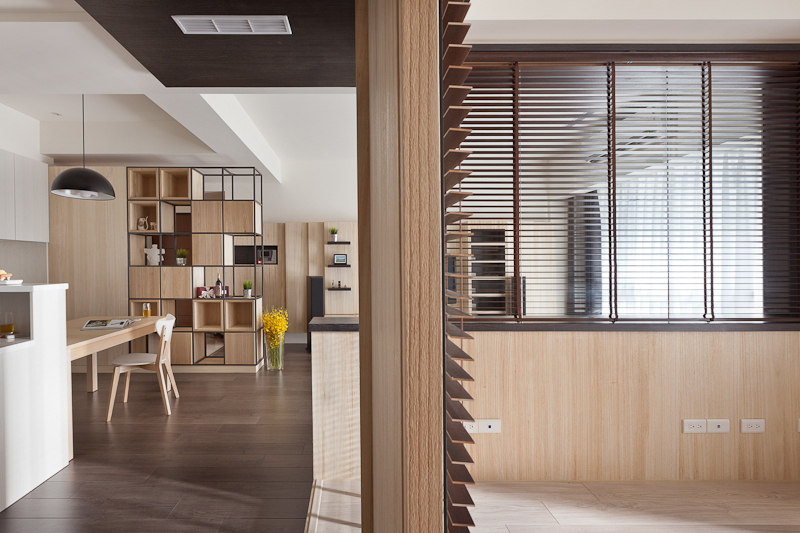 A cross-sectional view shows how the subtly varying wood grain and tones differentiate the rooms in this home. A dark stained woo shelf abuts the office room, with frameless glass wrapping here at the corner. 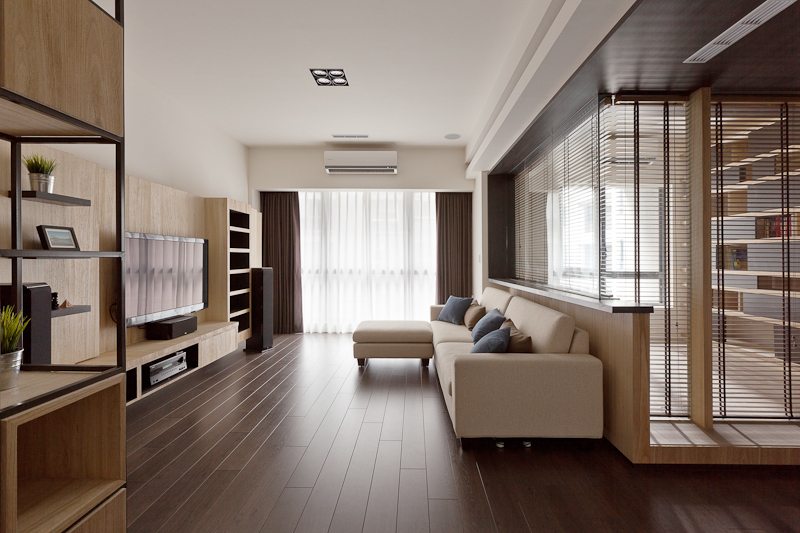 The living room is naturally lit through a large wall-size glass sliding door. 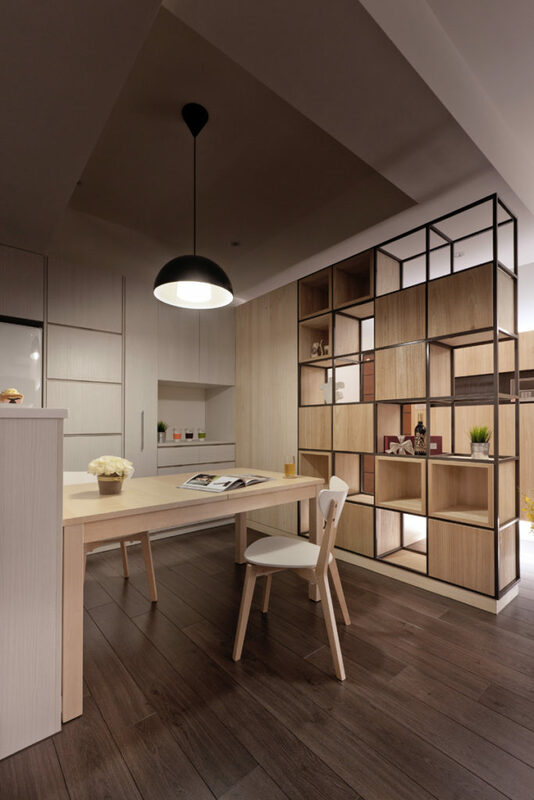 Media components are mounted on a large wall-length cabinetry and shelving structure. 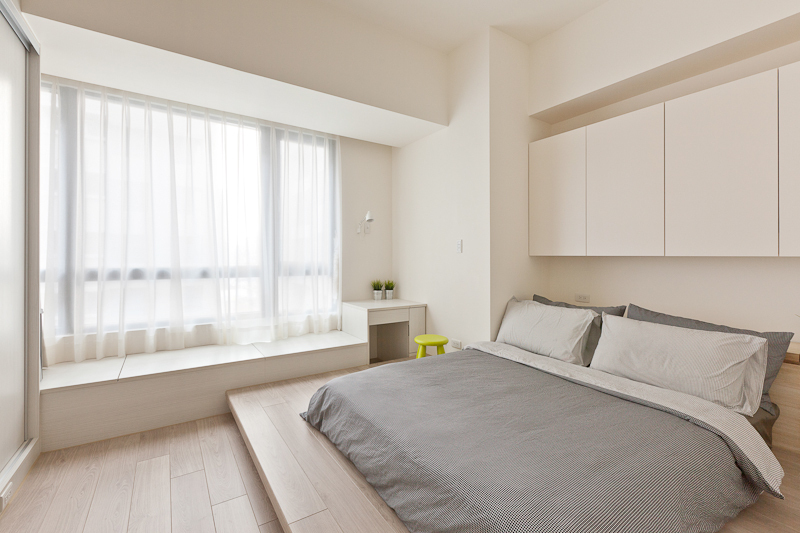 The bedroom holds a lighter touch, with white walls surrounding the hardwood flooring. Bed sits on a raised platform in abundant sunlight through the large window. 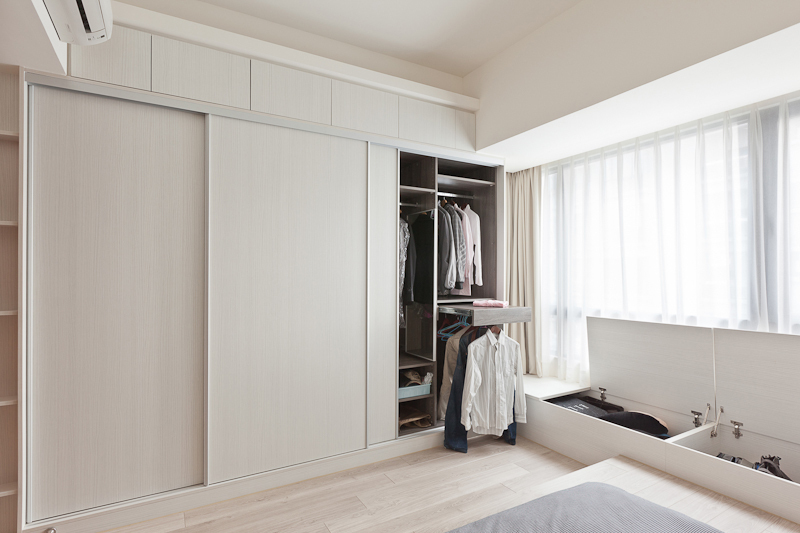 Space is utilized to maximum efficiency, with hidden storage below the windows, and a large closet with innovative slide-out racks and cubbies. 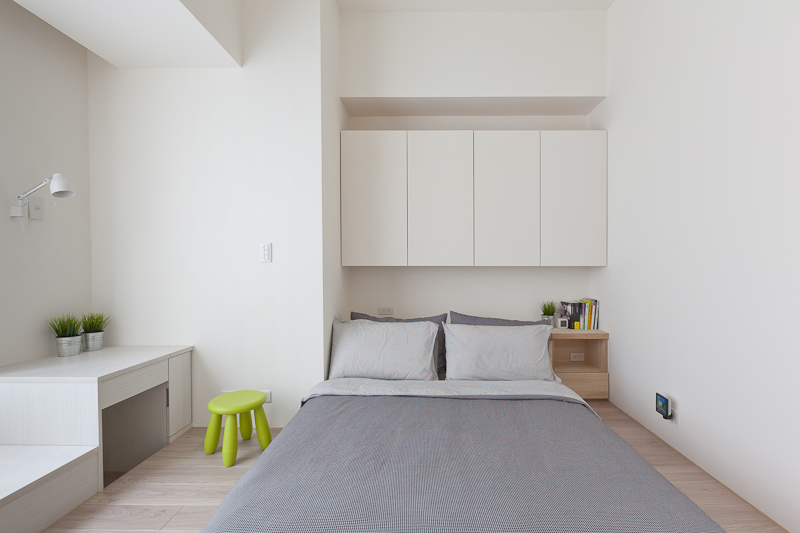 The bed stands below another set of sleek, minimalist cabinetry, with a small bedside table and built-in desk at left. 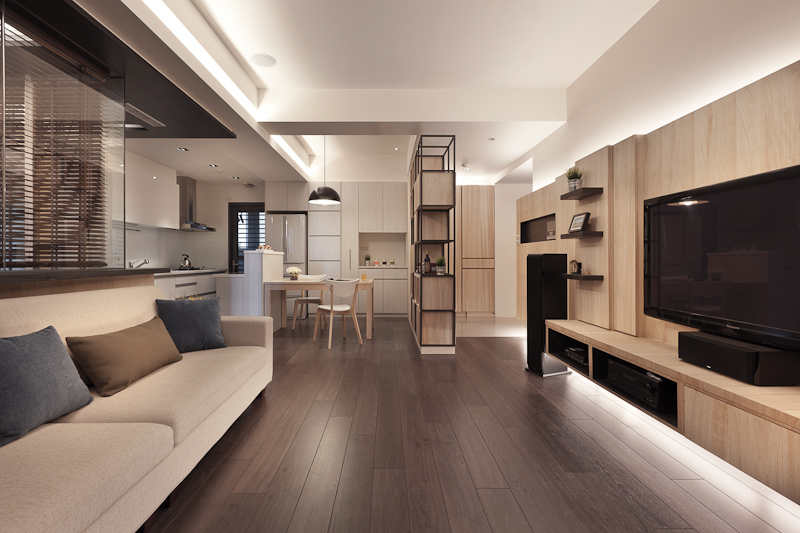 Returning the central living space, we can see how the open design and abundance of natural wood tones allows for a truly coherent visual experience.